You, like me, may not immediately think that there are many obvious parallels to be drawn between fencing and work life, however on our recent team retreat fencing expert Pricille Lapoutge certainly surprised us with her insight into how it is possible to apply lessons from fencing to our daily work. Perhaps my surprise can be put down to my own misconception of fencing. Having originally thought it to be an extremely aggressive sport, I very quickly learned that, while aggression can help, it’s much more effective to be intelligent, decisive, strategic and disciplined. It was amazing how many aspects of fencing (and, more specifically, the way in which we dealt with an alien activity which marries strategy with physical exertion) echo how we might behave in a new working situation. As Pricille said, fencing is a conversation. If you’re running away, you’re avoiding the situation and not saying what you need to say – you don’t need permission to be assertive, and it is important to be able to take control. The lesson to be learnt from fencing here is that, when feeling unconfident and under-informed, it is crucial that you collect information before engaging, and be proactive in getting the information right so that you feel confident when you act. Pricille advised us that no one is responsible for our own feelings, and that rather than immediately perceiving a negative and making yourself an excuse, it is important to see what advantages you have over others and use those to your advantage, turning a negative into a positive. Again, it is important take responsibility for what you say or do, and to remember that you are not responsible for other people’s feelings that you can’t control, and equally you shouldn’t expect anyone to be responsible for yours. Our feelings and Pricille’s responses felt very much tailored to the specific situation but, applying her advice more broadly, it is possible to see the parallels between fencing and work life which we had not anticipated. Fencing provided us with an insight into the team dynamic, and gave us a deeper understanding of how individuals all respond differently to the same situation. This is an invaluable insight to have. So, next time you’re trying your hand at a new activity (or even something at which you are a seasoned pro) consider the problems you face and how you overcome then, and see which of these lessons can be applied to your career – I think you may well be surprised. Aimee graduated with a degree in Law in 2011. 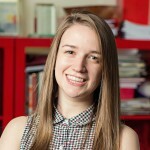 Until July 2015 Aimee worked as Executive Assistant to Obelisk's CEO, as well as supporting resourcing and engagement across the wider Obelisk community. Aimee is now a Police Officer with The Met. Wednesday Live: Are you an artist or a scientist?